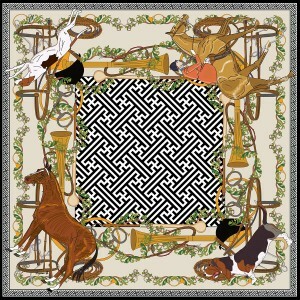 Horse and Hound scarf is back in stock! Pair it with a pair of white jeans and a simple spring top for a casual yet finished look. We hope you are all enjoying the last drops of summer. Beebs and Bess wishes you all a Happy Labor Day! Beebs and Bess wishes everyone all the best for 2014!!! Our first Holiday Season was wonderfully successful and oh,so much fun! We started with a bang at the Emmanuel Episcopal Church in lovely Middleburg, Va. Dagmar graciously welcomed us as houseguests in her delightful home (filled with all things Dagmar!) and hilariously helped us at the show. We were thrilled to meet many of her very stylish, friendly, horse-loving fans. Can’t wait to see them all again next year! The next week, we hitched up the reindeer again for the 1st annual Christmas Show at the Cape Fear Academy in Wilmington, N.C. Our Gidgets proved to be a big favorite for shoppers seeking stocking stuffers. Met lots of jovial, interesting vendors (always part of the fun), and were able to do some shopping for ourselves! During the holidays we were finally able to fulfill our promise to make more videos demonstrating the different ways to use our Gidget. Do have a peek – we’ve discovered a couple of very cool ways to use her. Many, many thanks to all of our friends and customers who shopped via beeb sandbess.com, telephone, and in person in Beebs’ basement. We hope the gals you were shopping for were well pleased with their gifts from Beebs and Bess! We’re excited about new things happening in the new year. Dagmar is busy designing our Spring and Summer scarf collection – wait till you see her gorgeous new creations – they are to die for! Once again, we wholeheartedly wish you all a HAPPY NEW YEAR!!! WS Arts Magazine article on Beebs & Bess 2013. Beebs & Bess is featured in WS Arts Magazine, a Winston-Salem, North Carolina area publication highlighting arts, culture, and style in our hometown area in the August 2013 issue. 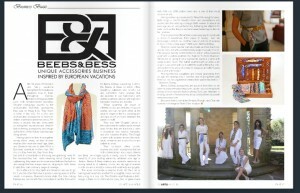 View the magazine online and read our article on page 27 to find out more about how our vacations to Europe originally inspired our first scarfbelt and accessories ideas that lead to us launching Beebs & Bess. 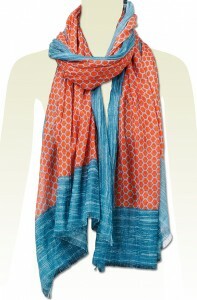 We chose our Winston scarf, pictured here, for this article of course. Available in Navy, Green, and Red, it has a trefoil design in delightful combinations that have proved to be one of our most popular scarf choices at our trunk shows. Winston Scarf from Beebs & Bess. See this news on the Facebook Post by Beebs & Bess. One thing that we have realized while choosing prints and patterns for our scarves, is that we can’t really pigeon hole the designs into one particular style. There is really something for everyone. When the show Mad Men premiered in summer 2007, there was a resurgence of the classic and sophisticated office looks of the late 1950s and early 1960s. Whether by tying a square silk scarf around the neck, or pulling a Jackie O by wearing a headscarf, the fashion statements of this era were back, and these vintage looks are still popular today. We love to wear our square Anne Scarf around the neck for a look that references this fashion moment in American history. While sharp, sophisticated, and fitted looks were becoming the trend in the United States, in London in the 1950s and 1960s, the mod subculture was developing its own unique sense of style. Fashionable modelss like Twiggy were often photographed in graphic, colorful patterns, like the ones featured on the McLean scarf. Ever since the rise of the hippie culture in the mid 1960s, there has been a demand for the “boho look”. While we may not be hippies in practice, we still love the colorful, free-spirited influence this group has had on fashion. The trefoil design on our Winston Scarf is reminiscent of the Batik patterns that have always been popular in Bohemian fashion. What’s great about these moments in fashion history is that they have remained on the cutting edge even 60 years later. We love that we can reference moments like this in the designs of our scarves. After this seemingly endless winter, the Beebs & Bess gals are more than ready to let the sunshine in. To us, spring means bright colors and bold patterns. The first place we like to go when the weather gets warm is to the garden. As we admire all of the spring blooms—tulips and daffodils galore! —we also manage to find plenty of inspiration for our Scarfbelts. 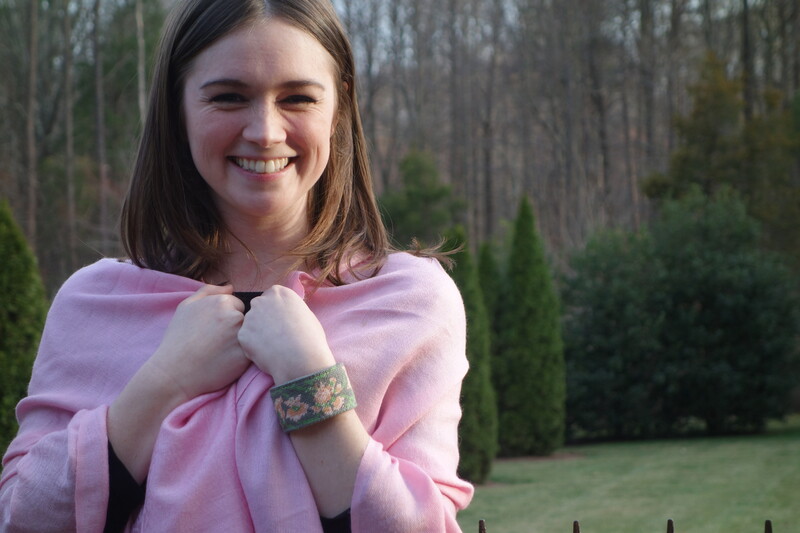 Our McLean scarf may be mod, but the patterns are like petals with beautiful pops of forsythia yellow, cherry blossom pink, and periwinkle purple. The floral shapes are also featured on the Morgan Scarf. But the garden is not all about the flowers. Sometimes inspiration comes from the creatures within the garden. We are especially fond of the flitting, chirping, colorgful birds so adorable in nature and perfect on a Beebs & Bess scarf. Avian embellishments really never go out of style, and we are very excited to play them up on our Nancy scarf that showcases beautiful birds, trees and other animals. While we are planting bulbs that will bloom next spring, we are daydreaming about what beautiful garden details to include in our Scarfbelt patterns. The Gidget, as we like to call it, is elegance with a tougher edge, and is reminiscent of a riding boot buckle. With summer quickly approaching, and the upcoming Triple Crown Series upon us, now seems to be the perfect time to sport an equestrian look. The Gidget is just the ticket for incorporating the equestrian trend. We love the idea of tying the Gidget around a wide-brimmed hat with one of our square silk scarves, slipping on a cocktail dress, and heading off to a day at the races, or at least to a Derby party. Tying the Gidget around a hat is a fresher twist to the often over-embellished Derby hat. While we love Audrey Hepburn’s black and white ensemble in My Fair Lady, and Mia Farrow’s sumptuous white outfits in the 1974 movie version of The Great Gatsby, our take on hat fashion is a bit simpler. Classic, but not too fussy—a straw fedora, embellished with a beautiful silk scarf. But the Gidget is not only for those who love the races. If you have the cowgirl spirit, the Gidget provides an Americana edge no matter how you style it, whether used with our bandana-inspired Alexandra scarf and a pair of blue jeans, or dressed up with a white eyelet shift paired with cowgirl boots. The Gidget is a truly versatile piece that creates a modern, but still classic look that can be dressed up or dressed down.